This is the time of year when we reflect on the event of the past year and prepare for what might be coming over the horizon. 2011 was a year of steady progress in the field of infectious diseases, with notable milestones in all of the big three and some game-changing developments for other infections. 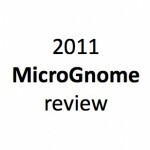 The MicroGnome has picked a handful of achievements for this 2011 MicroGnome review that should inspire anyone with an interest in infection. If you have been living under a stone all year, maybe you should try the coffee zone for a less demanding read. Reporting the preliminary results of a phase three trials of the RTS,S vaccine candidate in neonates and infant groups from seven African countries over 14 months, the authors of a November paper in the New England Journal of Medicine reported a halving of malaria, and a 45% reduction in severe malaria cases. While these effects are far less than routinely used childhood vaccines, they raise hopes for development of a mortality-reducing malaria vaccine. Promising early performance studies prompted the World Health Organisation and other donor agencies to equip clinical laboratories in resource-poor countries with rapid molecular screening tests for pulmonary tuberculosis. In a useful review of this application of molecular microbiology, Carlton Evans explains the need for caution in the introduction of this technology to low and middle income countries. There is a growing awareness of the potential for antiretroviral agents in a preventive role. In a mathematical model of the cost effectiveness and impact of different strategies, an international group showed that effective preventive pre-exposure prophylaxis of the uninfected partner could be more effective than commencing ART earlier in the infected partner. The application of mass spec-based methods for identifying the contents of blood cultures has been gathering pace in Europe for several years, and has started to spread to other parts of the world. While some clinical laboratory directors might have their heads stuck in the sand, there are plenty of pathologists who would give an arm and a leg for equipment that can trim around 24hr or more off the time to identification of bacterial causes of septicaemia. Klein and colleagues are one of many groups working out how to implement this emerging technology in a busy clinical laboratory service. the adverse effects of Australian produced vaccine are thought to have been due to suboptimal virus splitting by a deoxycholate-based procedure. Benefits of vaccination still outweigh the risk of adverse effect. A phase three trial of a tetravalent live attenuated vaccine against dengue virus is now under way. Once industrial production of this promising candidate has been established, its efficacy confirmed and administration optimised, it will be of considerable interest to many parts of the tropics where dengue is a substantial burden on the public health. So what’s in store for 2012, apart from more of the same? At a guess, it looks like we’re going to drill deeper into severe sepsis, see an expanding series of field studies and continue our peripatetic investigation of tropical infectious diseases. The language of infection series is set for significant expansion in support of teaching and training activities. One outcome of our 2011 MicroGnome Review was to recognise the need for an expanded writing team. The group sends you their best for 2012, and will now pause briefly to welcome in the New Year.